We are very excited to not only be featured in this magazine but we are thrilled that we actually wrote a little advice for all Brides to Be when creating a style for their wedding. A more modern look at what today's bride is looking for on their wedding day. Make sure to get your copy to see some of our top advice for your wedding day! 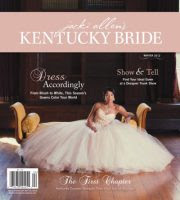 Make sure to check out Kentucky Bride for all the latest tips for today's modern Bride!